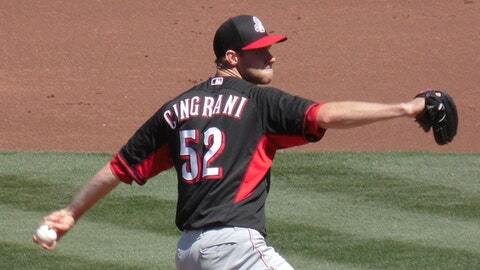 Reds pitcher Tony Cingrani gave up three runs and five hits in 4 1-3 innings. MESA, Ariz. (AP) — Brandon Phillips hit his third home run in four games and Roger Bernadina added to his big spring for Cincinnati, belting a three-run shot and driving in four runs to help the Reds defeat the Chicago Cubs 8-3 on Saturday. Bernadina, who went deep in the first inning off starter Edwin Jackson, is hitting .417 with three homers and 10 RBIs. Reds pitcher Tony Cingrani, a likely member of the rotation, gave up three runs and five hits in 4 1-3 innings. He struck out three and walked four. Jackson, slated to start the second game of the season in Pittsburgh, allowed four runs and eight hits in five innings. He struck out seven and walked one. Anthony Rizzo went 3 for 3 for the Cubs, raising his batting average to .368.